1. Since the suction will be weak if the battery is low. Please charge the vacuum for 4-5 hours before use. 2. Please clean the mesh filter at fixed period. 3. This vacuum cleaner is slightly louder than normal talks, so it would be a little noisy in a quiet environment. 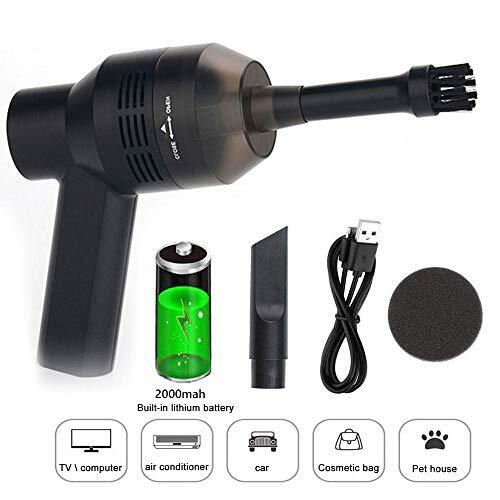 Small Area Vacuum Cleaner - With handheld size, this vacuum cleaner can be used for most small places, such as, mechanical keyboards, pianos, laptop, computer, pet house, or the debris in cosmetic bags, etc. Rechargeable & Cordless - Rechargeable cordless vacuum cleaner with 2000mAh lithium battery make it easier to clean the dust. Note: Please charge the vacuum cleaner for 4-5 hours before using. Since the suction will be weak if the battery is low. Easy to Clean - Provided with an effective filtration system, you can simply wash the filter with water and the reuse it. Package includes 2 replacement sponge filters. With 2 Vacuum Straws & 2 Sponge Filter - Comes with 2 types of nozzles for your needs. Flat nozzle can inhale little pieces of paper, and brush nozzle can dry ash and dust. Mini Portable Size - Handle Length: 3.14in / 7.98cm. Vacuum Length: 4.92in / 12.5cm. Flat Nozzle Length: 2.56in / 6.5cm. Brush Nozzle Length: 3.15in / 8cm.